Since the 1870's, the 12 gauge has given the world an amazing option for close range shooting. Whether it is used for clay shooting, self defense, hunting, or military or law enforcement applications, the 12 gauge effortlessly performs better than almost any other firearm at close range. 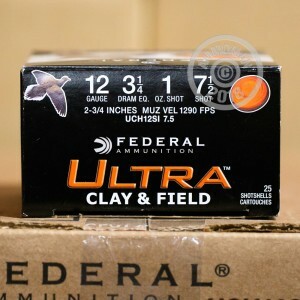 Since 1922, Federal has come to be one of the most loved ammunition companies in America. 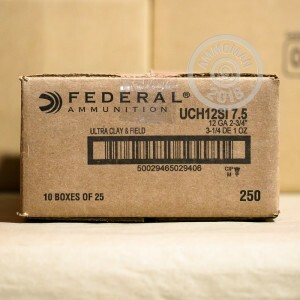 headquartered in Anoka, Minnesota, Federal's ammunition is proudly loaded in the USA. 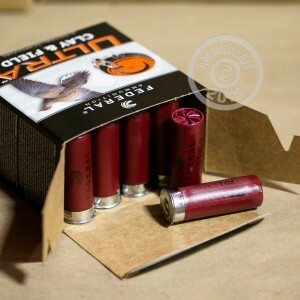 With these Ultra Clay and Field 2-3/4" shells you have just what you need for busting clays or dropping upland birds. Each hull carries a one ounce payload of #7.5 lead shot and achieves a muzzle velocity of 1,290 feet per second. Don't miss out on this chance to get 250 shells of this high quality ammunition from one of America's favorite manufacturers. Remember, at AmmoMan.com all orders over $99 will ship for FREE, so stock up and save! Great service with outstanding choices. Always happy when the rounds arrive on time.